After six awesome months of Bike Miami events, this coming Sunday we’ll have the May edition of Bike Miami Days, the last of the current season. It’s already getting way hot out there and in typical Miami fashion, Summer months are indoor months. In the Fall, the bikes come out again and invade Downtown. In the meantime, it’s time to bike all around and enjoy a car-free Miami, so mark your calendars and fill up your tires. You can find more information about May’s Bike Miami Days at the Bike Miami blog, or check out this pretty flyer designed for the event. I am totally going to abuse my power here for my personal benefit. My wife and I have a house rabbit named Fergus MacFoo. 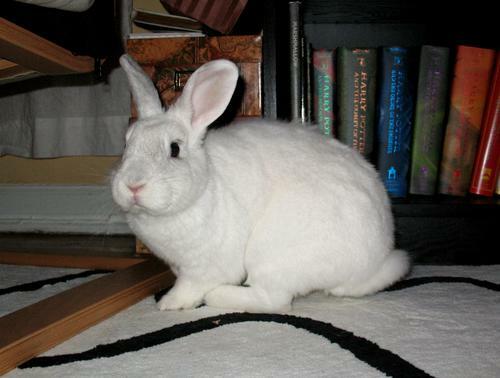 We’ve had him for about two to three years and for most of that time he has been by himself (he came to us as a mate for our rabbit Nuala, but she died just a few months after that). Fergus is a really nice bunny, quiet but with a great personality, not to mention litter-trained. My wife has always been allergic to our rabbits, but over the last year it has gotten really bad, to the point where she cannot be in the same room as the bunny. We’ve tried everything we can to be able to keep Fergus but the time has come to find him a new home. Easier said than done. We are looking for a new home for Fergus. Our ideal candidate is/has been a house rabbit owner who knows how to deal with rabbits. We’d also be happy to hear from people who would like to become bunny parents and who understand all that having a house rabbit entails (ask us, we’ll tell you). If this sounds like you, please take a look at Fergus’ BunSpace.com profile for more information, pics and contact details. I had to fly to Puerto Rico for family matters and I just got back. I need to catch up on all my backed up stuff before I can start posting again, so hopefully by next week. One of the advantages of Bike Miami, the ability to explore Downtown Miami in a slower, more leisurely way, was never more evident for me than during this last iteration of the monthly event, when a new route extension was opened from Downtown to Lummus Landing, right on the Miami River. I’ve lived in Miami for almost 15 years now and I just never knew that was back there, hiding coyly from the bustle of I-95. Getting the chance to explore this area on my bike was fantastic, and I got to see things I did not know we had down here, like the stables of the Miami Mounted Police, Ft. Dallas, the Scottish Rite Masonic Temple, and Lummus Park & Landing. Then there was also the Public Fish Market. Wait, the what? 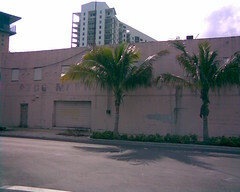 A nondescript building in faded tones of pink, the Public Fish Market sits on NW N River Dr, almost under the SW 1st St bridge and ideally accessible from SW 2nd St. The building is obviously abandonded, not necessarily falling apart, but very much unused for years, all painted lettering almost unreadable at this point. When I first rode by I completely ignored it; it just didn’t exist in my peripheral vision, a phenomenon, I dare say, happens to most passerbys. It was only when we were riding back into Downtown that my wife took notice of it. She read something written on the wall out loud and that’s what made me look right and see the derelict structure for the first time. This market was built for the benefit of the general public so they may buy fish at reasonable prices. 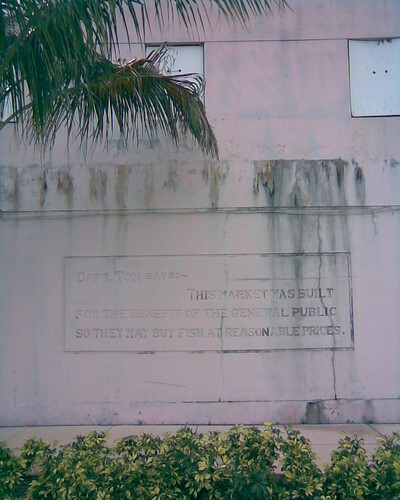 A lot of questions went through my mind as I turned around to read the inscription myself: We had a public fish market? I wonder how many know of this? Who was Capt. Tom? More to the point however, I wondered how come this building is not in use anymore! A. Informational Presentation on the Status of the Garcia Brothers Seafood Inc. Neither of these reference are about the public fish market on NW N River Dr. though they do refer to the possible development of such an establishment in the area (Garcia Brothers Seafood now operates a fish market on premises). I’m going to keep digging to see if I can find more info on this building’s history (perhaps this will merit a visit to the library Downtown). I am fascinated by this building, partly because of the implied history in it, but mainly because of the promise of what it could be again. Having seen the magnificent example of a public market in Pike Place Market in Seattle, my wife and I both had sudden daydreams of a similar space here in Miami. A quick look around us put us in the mindset of developers. In Part 2 I’ll share our vision of this possible Miami Public Market. Nikki Beach WMC Extravaganza ! On Thursday March 27th, 2008 one of the main events of the Winter Music Conference will be the 17 hour party extravaganza at Nikki Beach from Noon until 5 the next morning – with 32 DJs, with the Main Star DJ Robbie Rivera along with Benny Benassi a, Steve Angello, Sebastian Ingrosso, Tommy Lee & DJ Aero, DJ Rap, Sander van Doorn, The Shapshifters, Axwell, Deadmau5, Laidback Luke and Richard Vission. The WMC runs from March 25th to 29th , culminating with the Ultra Music Festival – the largest Techno/Dance Festival this side of the Planet. Continental and Delta travelers now fly in and out of the sparkling new Terminal H at MIA. Hopefully TSA will get it’s act together at the checkpoints. Last week all lines had to go through one person checking ID’s. This led to huge backups and flights taking off late – there is no point in having two or three scanners when such a bottleneck occurs. A moving walkway would have been nice as well, and perhaps some places to eat that offer more than microwaved fast food chain glop ? At least it looks nicer than G Terminal. Happy Year of the Rat ! From yesterday’s Google China page. Posted in Uncategorized | Comments Off on Happy Year of the Rat ! The Future Arrives ! – Any Buyers ? The new Miami Skyline ( or “Biscayne Wall” as it is known to pilots ) is really taking shape – we have the most impressive skyline south of Manhattan. Great bargains around this time next year ! Posted in Uncategorized | Comments Off on The Future Arrives ! – Any Buyers ? The Cats at Jimbo’s love to eat pizza !